Emma picked this month's topics. Be sure to go and look at what everyone else has posted! I needed a clipboard for work as I've been doing observations this week. Paperchase did not have the selection I had hoped for: in fact they had precisely one clipboard available, and it was a very dull clear plastic affair. So I covered it in this cherry print paper I found on the third floor of aforementioned Paperchase. I fear Emma will be most disgusted that I have not done this at all properly or followed her advice, and have just taped it on and stuck some library film over the top. Sorry Emma! But I was in a hurry to get it done. It meant that, on the first day of observations, I could co-ordinate my clipboard with my outfit, as I also wore the big cherries brooch I got from Oliver Bonas ages ago. I won all this yarn from Jimmy Beans. It is the Lorna's Laces LE colour for June - Stitch Red - and I have a skein in every weight. I was overwhelmed when it arrived and it has me buzzing with new ideas for things! I love it all, but I think the Helen's Laces is my favourite because I would never have splurged on a skein of this until I had a chance to feel what it was like, so that makes it an extra special treat. 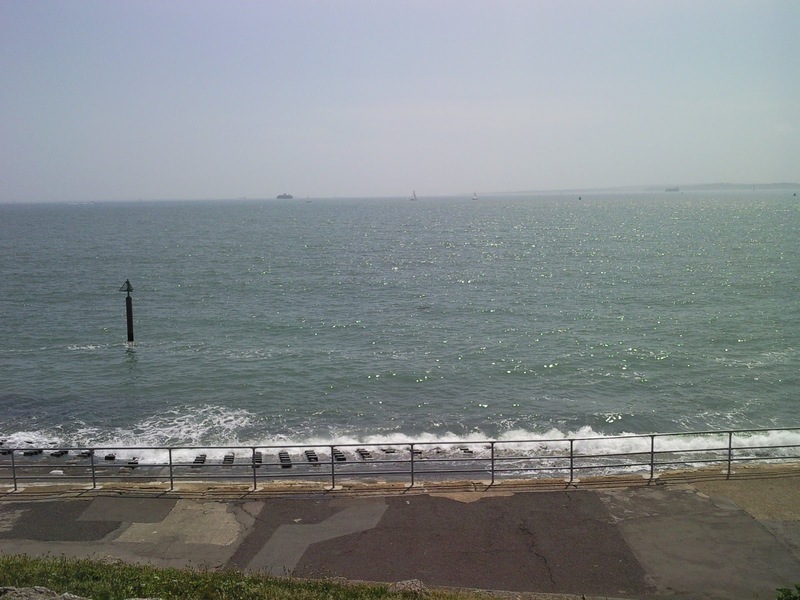 Summer, for me, should always involve the sea. 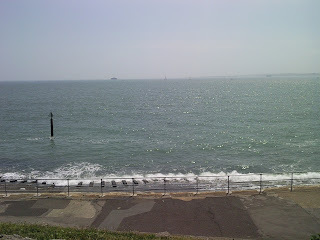 This picture was taken from the little hill that sits next to Southsea Castle in Portsmouth. It was my absolute favourite place during my teenage years and it still sits in my top five now, even though it might have slipped from the top spot. Haven't been back in a while but with a long free summer stretching out ahead of me, I might have to pop down for a visit. Willo the Wisp was my favourite. Mother Hand would argue that my favourite was actually the Flumps; possibly Mr Benn. She, of course, can remember my formative years a lot better than me. However, I do remember when I was in my early teens and Willo the Wisp reappeared on TV for 5 minutes before 6pm on C4. I appreciated the retro a lot, and so this is probably why I remember it so fondly. I liked all the characters but Edna held a special place in my heart. I'd quite like an Edna t-shirt. Must go and have a look at what Cafe Press can do for me. Thanks for the topics this month, Emma! I'm hosting Crafty Photo Scavenger Hunt for July, so look out fot eh topics which will be posted very shortly.